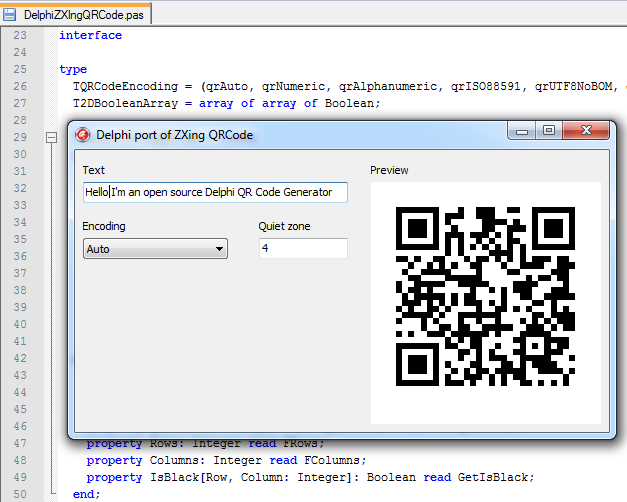 DelphiZXingQRCode is a Delphi port of the QR Code functionality in ZXing, an open source barcode image processing library. The code was ported to Delphi by Senior Debenu Developer, Kevin Newman. The port retains the original Apache License (v2.0). Need to add QR barcodes to PDFs? Check out Quick PDF Library SDK. The DelphiZXingQRCode source files and sample application can be downloaded from the link below. Below is a screenshot of the Delphi source file for DelphiZXingQRCode and the accompanying test application. Any feedback or questions are welcome, don’t be shy!